U.S. President and North Korean leader meet face to face, discuss denuclearization. 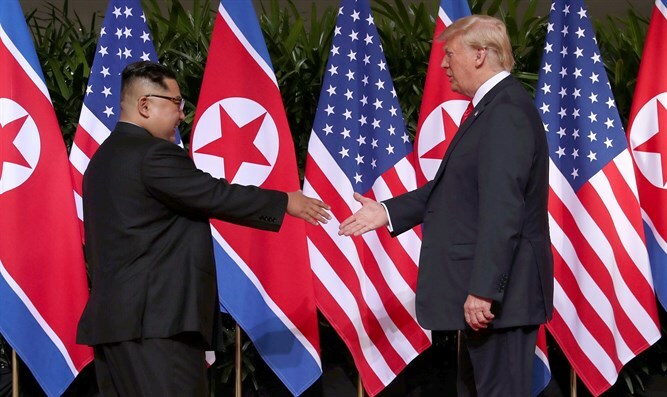 U.S. President Donald Trump and North Korean leader Kim Jong Un met one-on-one in Singapore on Tuesday morning (local time). Before their meeting, the two shook hands at the entrance to the Capella Hotel in Sentosa. In brief comments to reporters before the one-on-one meeting, Trump said he believed the meeting will be a "tremendous success". The two leaders then met one-on-one for about 45 minutes in a room at the hotel. Trump said following that one meeting that it was "very, very good. Excellent relationship." The one-on-one meeting was followed by an expanded bilateral meeting with the two leaders’ advisors, which will followed by a working lunch with delegations from both sides. Trump will meet the media at 4:00 p.m. Singapore time (4:00 a.m. Eastern Daylight Time, 11:00 a.m. Israel time). He will leave the Capella Hotel approximately two hours later, with his flight from Singapore scheduled to depart at 7:00 p.m. local time. The U.S. delegation at the expanded bilateral meeting will include Secretary of State Mike Pompeo, White House Chief of Staff John Kelly and National Security Advisor John Bolton.